I ordered four items from this collection and I am quite pleased with the quality the price and tie fit. beautiful dress. Many compliments! Comfortable to wear, love the packets at each side . I bought the dress and navy blue it was beautiful I wore it to my mom's funeral. 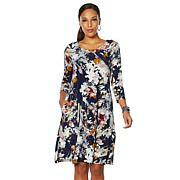 This is the most comfortable dress, has pockets and wears very nicely. You can belt it or leave it on it's own. No wrinkles and great material. I have to get the other colors also! Would recommend to anyone for sure!